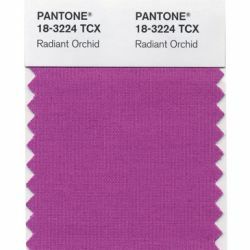 Last month when Pantone, the world’s authority on color, named Radiant Orchid, “a captivating, magical, enigmatic purple”, as the Color of the Year, it had already made its way into the spring 2014 fashion shows and was beginning to be seen on the red carpet. The company’s press release defines the color “as an enchanting harmony of fuchsia, purple and pink undertones”. Expect to see variations of this hue (in colors such as magenta, lavender and lilac) in women’s clothing and accessories throughout the year. If purple isn’t your color or if you don’t want to go for the head-to-toe look, you can use accessories to add splashes of various shades of orchid to an outfit. As you know, my favorite accessory is vintage costume jewelry. 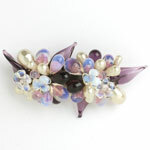 Because orchid is a blend of tones of purple, this article discusses shades of purple in jewelry. 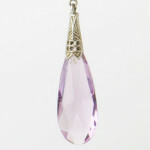 You will find a selection of vintage costume jewelry pieces in variations of purple hues on the TruFaux Jewels website. 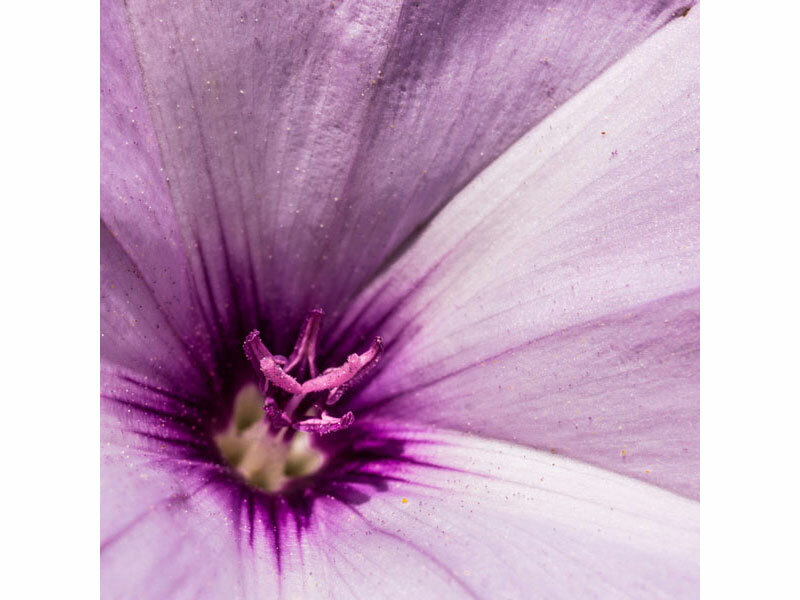 Many gemstones (often called precious stones) occur naturally in numerous tones of the color purple, but the one most often associated with that royal hue is amethyst. This variety of the quartz mineral species ranges from deep purple to pale bluish-violet to lilac or mauve. (See my article Fall 2013 Fashion Colors: Amethyst for more information on this gemstone.) Another gemstone that occurs in a range of colors is sapphire, a member of the mineral species corundum. According to the Gem Encyclopedia, fancy sapphires come in colors such as violet, pink and purple. 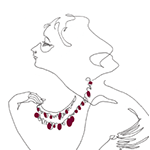 Some rubies, also in the corundum family, come in a purplish-red (raspberry) hue. Tourmalines, another gem species, have various shades of nearly every color, including pink and purple. 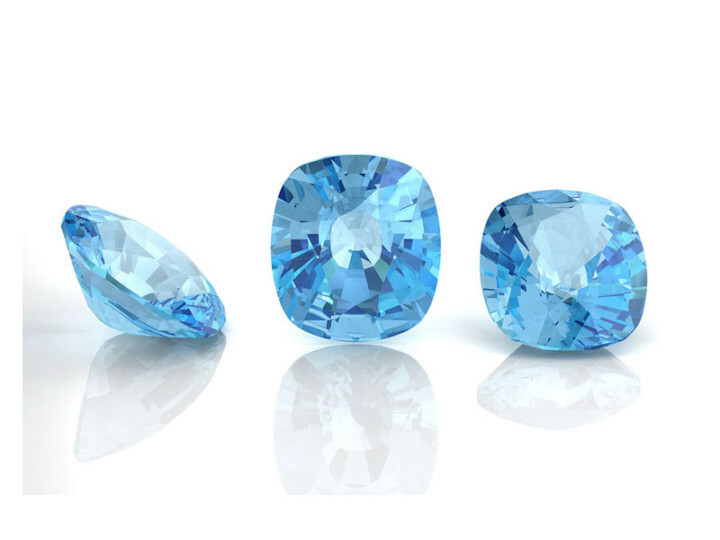 Imitation gemstones (stones made to imitate the appearance of natural gemstones) in various colors have been produced from glass for centuries. 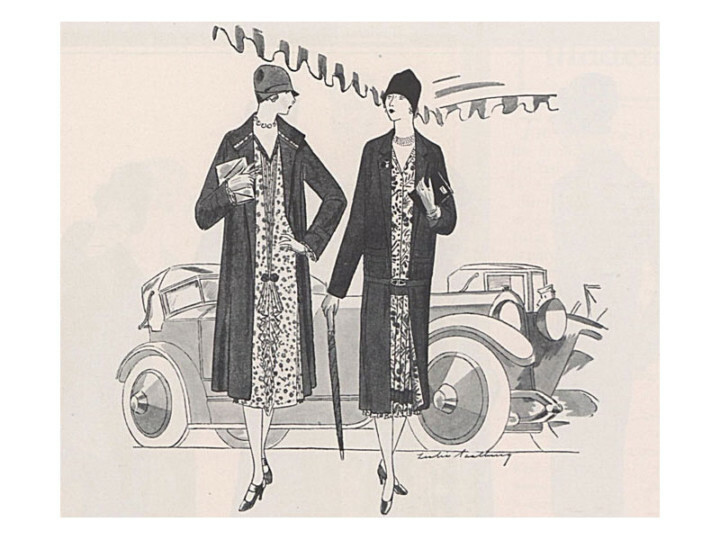 Glass stones (known as rhinestones or paste) and beads in many shades of purple, in imitation of amethysts, were popular in vintage costume jewelry from the 1920s through the 1950s. 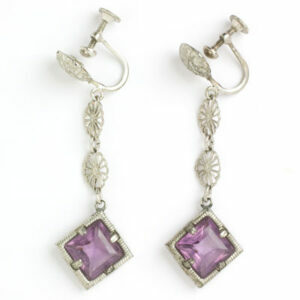 This pair of Art Deco earrings feature glass teardrops in a pinky-purple shade. Click through to see a detailed description and additional photos of these stunning earrings. See also these Amethyst & Pearl Art Deco Drop Earrings, which are luxuriously long (at 2 3/8″) and have faceted glass drops and beads in this color. Also from the 1920s, here’s a close-up of the earrings in the Amethyst & Filigree Art Deco Pendant & Earrings Set. The glass stones are a deeper, yet similar shade of purple. You have probably seen many examples of glass beads in necklaces and earrings from the 1920s-1950s, but you may not have seen many brooches like this one from France (on the left). This post-World War II piece features leaves, flowers and beads in deep amethyst, pink, blue and clear glass layered with faux pearls. Many of these amazing beads are multi-colored. All of the elements are wired onto a brass grid, a common construction style used in France during these years by makers such as Louis Rousselet. Detailed photos and a complete description of this brooch are here. The Pantone press release stated: “While the 2013 color of the year, PANTONE 17-5641 Emerald, served as a symbol of growth, renewal and prosperity, Radiant Orchid reaches across the color wheel to intrigue the eye and spark the imagination … An invitation to innovation, Radiant Orchid encourages expanded creativity and originality, which is increasingly valued in today’s society”. To read the entire press release and/or download the Spring 2014: Pantone Fashion Color Report, go the company’s website.